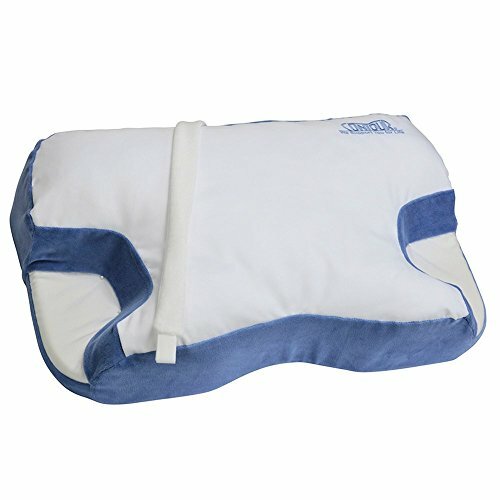 The Contour Products CPAP Pillow 2.0 is a precision-molded pillow that provides consistent positioning and maintains edge integrity to minimizes facial pressure, mask shifting and leaks. Made of highly resilient, cushiony material to better hold shape, it enhances head, neck and airway alignment for better sleep. Comes with a form-fitting plush cover that enhances comfort and is easy to clean. The dual cutout design accommodates the mask, allowing comfortable left or right side sleeping without compromising CPAP compliance. Works with all major brand and styles of masks. Includes 2 year Manufacturer's Limited Warranty. Since the introduction of our first product in 1991, Contour Products has emerged as a recognized leader of specialty sleep, comfort and support solutions. Our products help to properly align the body for overall comfort and improved well-being.